Jari-Matti Latvala clinches win in Sweden. Comments Off on Jari-Matti Latvala clinches win in Sweden. Jari-Matti Latvala escaped a late puncture to wrap up victory in Rally Sweden. The Ford driver’s 35-second lead dwindled to just eight seconds when he hit a rock and damaged a front tyre on the antepenultimate stage. But quickest time on the next test rebuilt his advantage and allowed to come home comfortable ahead of main rival Mikko Hirvonen. The Finnish duo had taken charge of the rally from Friday afternoon onwards, after set-up concerns for Mads Ostberg, a spin by Petter Solberg and a two-minute excursion into a snow bank by Sebastien Loeb saw the trio fall away from the lead battle. Latvala gradually edged away from Hirvonen as the weekend progressed, with a few errant set-up changes and high tyre wear on the Citroen ultimately costing Hirvonen too much time. Solberg and Ostberg ended up in a long tussle over the final podium spot, which was won by the Adapta Ford when the works man lost time with a puncture from the same rock his team-mate Latvala had hit. Myriad incidents for Loeb meant he could only finish sixth, with M-Sport Ford’s Evgeny Novikov repeating his impressive Monte Carlo form by driving fast enough to stay out of the recovering factory Citroen’s reach and secure fifth place. 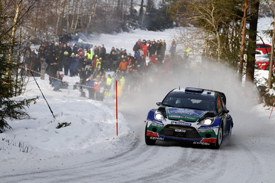 Henning Solberg was seventh in the Go Fast Ford, ahead of top Mini driver Patrik Sandell, whose team-mate Dani Sordo led after Thursday night’s superspecial but damaged his car’s engine in an incident with a snow bank on Friday afternoon. Martin Prokop (Czech Ford) and World Rally Car debutant Eyvind Brynildsen in the second Adapta car completed the top 10. Sebastien Ogier was 11th in the Volkswagen-run S2000 Skoda, while P-G Andersson gave Proton a maiden victory in the S2000 class.